All transactions are safe and secure with a reliable history in online purchasing behind each of our associates. Buy the Chillin' Like a Villain Loki t-shirt to own Thor clothing and merchandise. 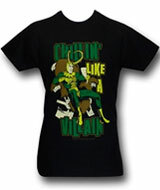 The Chillin' Like a Villain Loki t-shirt featured here is based on Thor's adoptive brother turned archenemy. After Odin killed Loki's father, frost giant Laufey, he adopted him and treated his as his own, but Loki didn't see it that way. He resented the attention given to his brother and became the mischievous one with an evil flare. If you have a naughty side then this may be the tee for you. In addition to the Chillin' Like a Villain Loki tee above, browse the Thor Clothing Gallery for more apparel like men's and women's clothes, kids shirts or hoodies.